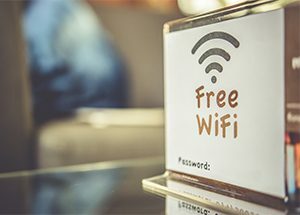 Given the rapidly changing technological needs of restaurants and retail spaces that both engage customers and support IT infrastructure, reliable Wi-Fi networks are imperative. Restaurant and retail industries require key features from a wireless network, such as size, security, and accessibility for both employees and customers. Ensuring dependable data allows for data to be collected from the customer based on relevance and, as a result, creates insights and business outcomes. IT teams are being challenged to keep up with the pace of change and the complexity of technology, resulting in companies’ option to outsource their IT departments. Managing Wi-Fi access and infrastructure requires both business and technical resources. IT staff are required to maintain software updates and firmware patches, be aware of potential security threats, navigate new applications before they are released, and ultimately protect the infrastructure investment. Businesses must manage both the expectations of the IT team and the expenses that come with teach task. In some cases, it may be necessary to delegate some tasks to an outside party. By outsourcing Wi-Fi management, businesses are able to focus on core initiatives while another service team manages technology deployment. Benefits of managed Wi-Fi solutions include: cost savings, decreased risks to infrastructure, improved quality of service, and increased flexibility for new applications. Managed Wi-Fi requires IT staff to respond to changing business environments, incidents and trouble shooting and hardware replacements, among other key tasks. After evaluation, some business may find that outsourcing some or all tasks saves both time and investment. The “utility model” for managed Wi-Fi is often the easiest to adopt for retailers and restaurants.